You can study English at home to develop your English skills. Our ideas and advice will help you to set targets and learn English independently and in your own free time. ❶ Take our online English test to check your English level. ❷ Get study targets from our English level descriptions (A1, A2, B1, B2, C1, C2). ❸ Take our free English lessons: Grammar, Vocabulary, Communication. 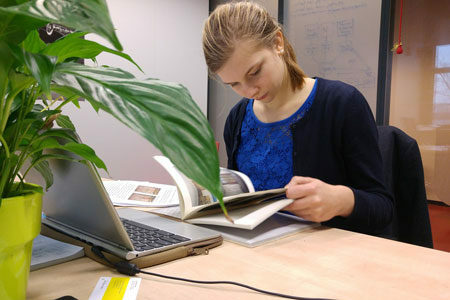 ❹ Try the study ideas on our blog and get updates on Twitter and Facebook. ❺ Learn by doing and practise using English. We always ask English language students this question, because it helps us to give better advice. We usually recommend General English if you have English level A1, English level A2 or English level B1, but you can also specialise in other areas. General English is the best choice for everyday conversation skills, or maybe you want English for travel, meeting new people, listening to music and more! Business English or English for work is ideal if you need English for a specific purpose, such as legal English, medical English, etc. English proficiency examinations have preparation courses which are beneficial when you want to study abroad or apply for residence in native English speaking countries. You can decide when and how often and you would like to study. We recommend that you set your own timetable as regular practice is more beneficial - just like learning to play a musical instrument! Independent students can set their own targets, and you can decide what is important, e.g. to develop your English grammar or your listening skills. Studying English in your own time can reduce the cost of learning a language. With good quality self-study resources there is a lot you can learn by yourself. This means that you don't need to purely rely on classroom learning. Self-study gives you the freedom to choose study materials that will appeal to you, e.g. the visual layout, topics, audio resources. This can benefit your learning style and complement your English language learning. How can you learn English faster? English courses with a qualified English teacher who help you to practise speaking English, give motivation and feedback. Language immersion by staying in an English-speaking country to work or study English abroad.